In many cases, children will grow out of the teeth grinding as their permanent teeth develop, replacing poorly aligned or painful baby teeth. If your child grinds his or her teeth more frequently, or you begin to notice significant damage, it may be more serious and need to be addressed by Drs. Mark Morrow, April Lai, and Kerry Edwards before it causes more permanent pain or problems. In some cases, our team at Morrow, Lai & Edwards Pediatric Dentistry may recommend that your child wears a protective mouthguard to prevent grinding, or work with a therapist or other specialist to develop awareness of the grinding. If the grinding is caused by stress or anxiety, it may be helpful for you to sit down and talk to your child each day about how she is feeling, and why, to help her work through the stress. 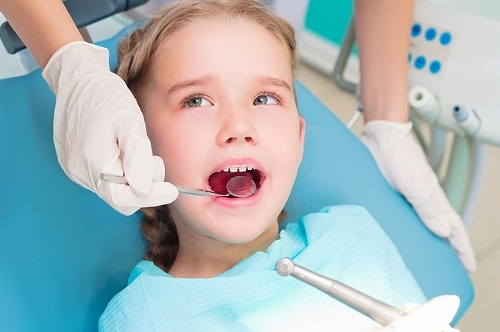 Teeth grinding can be a painful, problematic condition for some children. However, a combination of parental vigilance and frequent visits for regular checkups at our Tulsa, OK office can help. If you are concerned that your child may be grinding his or her teeth, and it could cause permanent damage before the child grows out of it, come talk to us about strategies for dealing with bruxism, and ways for you to help your child.